Research has revealed that around 36 million Americans are affected by hearing loss that is significant enough to be having an adverse impact on their quality of life. The social impact of untreated hearing loss have been well documented and include: decreased workplace effectiveness and income; difficulty in social situations; and additional strain on personal relationships. Recently researchers and scientists from the renowned Johns Hopkins University of Medicine have also found strong links between hearing loss and an increased incidence of dementia. 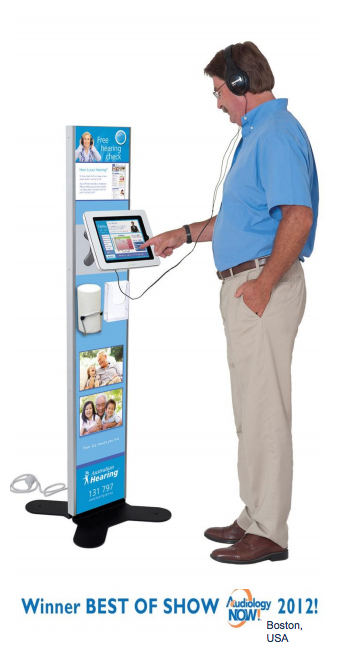 Winner of BEST OF SHOW prize at the world’s largest hearing industry convention in Boston in 2012, the Touch Screen Hearing Kiosk makes it easier for people to access a hearing check, learn if hearing loss is affecting their life, and access hearing services. It is free, takes a few minutes, and is extremely easy for people to use – thanks to the aid of a video guide. If the user is showing signs of significant hearing loss, they are able to request a FREE Hearing Report and request a FREE consultation at one of our conveniently location clinics. As an active community business, Neighborhood Hearing Aid Centers is dedicated to helping people manage their hearing impairment so they have a better quality of life. 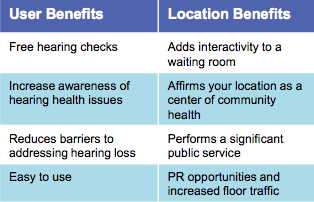 Adding a Touch Screen Hearing Kiosk to your location will reinforce your commitment to the health and well-being of patients and clients AT NO COST TO YOU! For details contact Ryan at 913-871-6014.